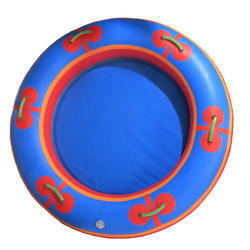 Durable, high quality water park round rafts are all built using 1000 denier UV resistant "double-thick" polyester reinforced Hypalon & Neoprene. Each sled is hand made using glue bonded overlapping seams. A double layer padded floor on the bottom. Molded strong handles and Non return valves are fitted. Perfect for recreation, Ganesh Manufacturing has sold Thousands of these durable Slide Rafts to Water parks in India & Asian Countries.